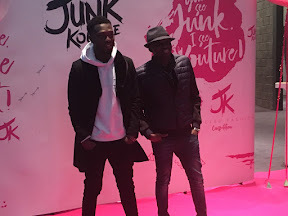 LOUIS Walsh admitted he was doing his first bit of work this year as he joined Saturdays' singer Una Healy as judge at the live final of Junk Kouture in Scotland. And although he claimed he was anything but fashionable, Louis was in fine fettle as secondary kids from across Scotland battled it out with some weird and wonderful creations made from everyday junk. 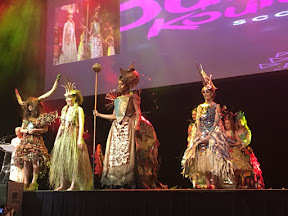 TheShowbizlion.com was massively impressed by the intricacy of the designs on offer and we saw an array of outfits that could easily grace events like the Oscars or Emmys. Lady Gaga would have had a field day. Telly gal Cat Cubie presented the awards while X Factor runners-up Reggie ‘n Bollie entertained crowds at the final, at the SEC Armadillo. 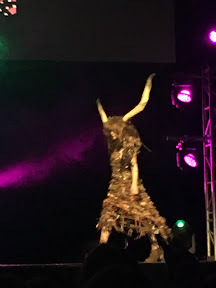 Winners included Hillhead Academy who won the performance award for their Highland Cow based dress which included pigs’ trotters. Una handed over the trophy to the Junk Kouture Scotland overall winner which went to St Paul’s RC Academy with a dress made from old maps.